Chkdsk or checkdisk is a utility tool provided by Microsoft Corporation for error checking the volume partition. It automatically repairs error on the volume partition if any and can be of great help if you hard disk have encountered Bad sectors or some portion of your hard drive have become unreadable. Chkdsk is a very useful tool provided for NTFS volumes and is bundled with windows 7 to check and repair errors. It can also check errors for FAT and FAT32 volumes. You can run Chkdsk from three ways. 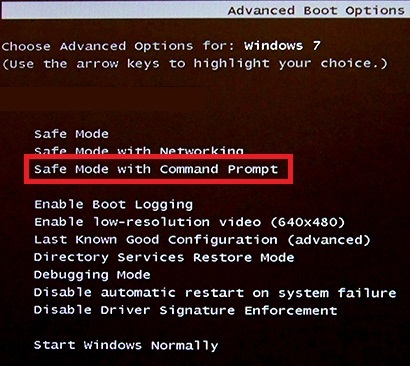 Remember this command can be executed only with Admin privileges. So if you are not running Command prompt as an Admin use this alternative method to execute checkdisk. Open My Computer –> Open “C” drive –> Open folder “Windows”–> Open folder “System32” –> Type “cmd” in the search box in the upper right hand side of the explorer bar –> select the one with black icon –> Right click it and select “Run As Administrator” –> Select “Yes” –> Type “Chkdsk X:” and Press Enter. Now the System will open a window with two options. Select your choice (I would suggest select both the options) and then click “START”. 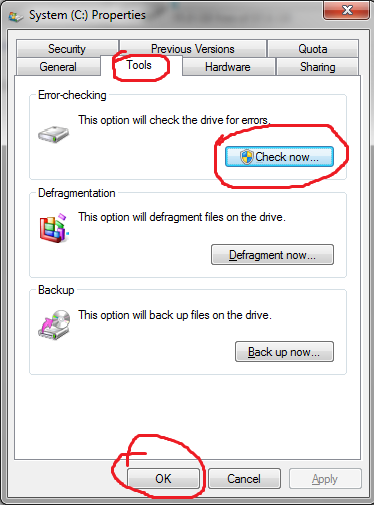 Now this is the Best Option for checking any serious errors of the partition volume. If the above two options fail to provide remedy to your problem, this option could be the only solution. 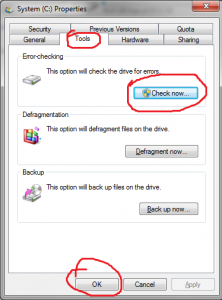 Before you start with the recovery procedure I would suggest you to be very cautious and take a back up of the data inside your drive to some other drives if possible. Though both these command are taken for granted to be doing the same task, there is a level of difference between them. The most important is that the Logical system file errors can be fixed by Chkdsk but scandsk is unable to fix such problem. Moreover Chkdsk is somewhat a better tool and an upgraded version for carrying out repair and recovery tasks for NTFS file systems. This is the reason why we do not have scandsk in windows 7. The NTFS volume partitions are something which scandsk is not compatible with. Hence Microsoft replaced all its tasks to chdsk program. Win 7 chkdsk program can easily repair logical errors do some tasks which scandsk was unable to do and most importantly it’s the next gen repair tool for Windows Platform. volumename: : Name of the volume or drive or the mount point. [Path] FileName : Path of the required file or folder or disk to be checked. /f : Fixes disk errors. This can be done only in the Locked Disk. 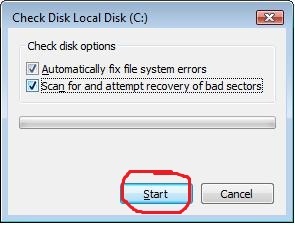 If it cannot lock the drive it will ask you to check the disk at next restart. /r : This command finds bad sectors and tries to recover information which is at least readable. For this too the drive must be under lockdown situation. /x : This switch can be used only with NTFS volumes. This command Forcefully dismounts the volume, only when it is necessary. It closes all the present Open handles. /i : This too can be used with NTFS volumes only. This command performs a low level check of entries indexed, hence reducing the time required for checking errors. /c : To be used with NTFS partitions only. This switch skips the cycle checking within the structured folders, thereby lessening the time required for running Chkdsk. /l[:size] : To be used with NTFS volumes only. This switch changes the size of log file. /? : Default command prompt help options are displayed.